Italian sculptor, architect, silversmith and painter. He was the son of a lawyer and began to study law, but a precocious gift for drawing led him to study both sculpture and architecture with Cosimo Fanzago. On Fanzagos death (1678) Vaccaro inherited several important commissions, one of which was the marble monument to Francesco Rocco in the church of the Pietà dei Turchini, Naples. In this powerfully realistic work (begun 1676 by Fanzago and completed by Vaccaro two years later) the portly Rocco kneels on a cushion, his left hand spread across his ample chest and his voluminous drapery overlapping the surrounding frame. There followed commissions for several bronze and silver figures in S Gennaro, Naples (1679), marble putti in Santa Croce, Torre del Greco (1680), and stucco figures in the Gesù delle Monache, Naples (1681-5). The stucco decoration in the last, particularly the caryatid-angels, is reminiscent of Algardi s four allegorical marble figures on the tomb of Leo XI in St Peter s, Rome, which Vaccaro could have seen on a journey there. The classicism of two terracottas of the Labours of Hercules (Naples, Museo Civico Gaetano Filangieri) is again indebted to sculpture in Rome. In the 1680s and 1690s Vaccaro and his growing workshop undertook many large-scale decorative schemes in Naples. They executed stucco decorations (1682) in S Giorgio, over life-size stucco statues of St Helen and St Constantine (both 1689) in S Giovanni Maggiore and the light and graceful stucco decoration (1693-98) of the transept and cupola of S Agostino degli Scalzi, which was one of the most successful decorative works of the period and of considerable influence. Vaccaro was in the forefront of the change from a High Baroque style to the more refined treatment known as barocchetto. 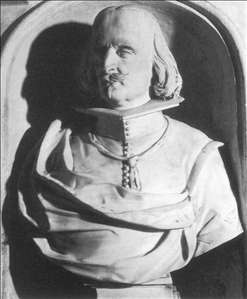 See more details about "Bust of Vincenzo Petra"